Life has a way of reminding Penny Hart that he’s five feet, eight inches tall. There was that time he scored nine touchdowns in his finale at King's Ridge Christian high school and when he told people—good friends, even—they didn’t believe him. 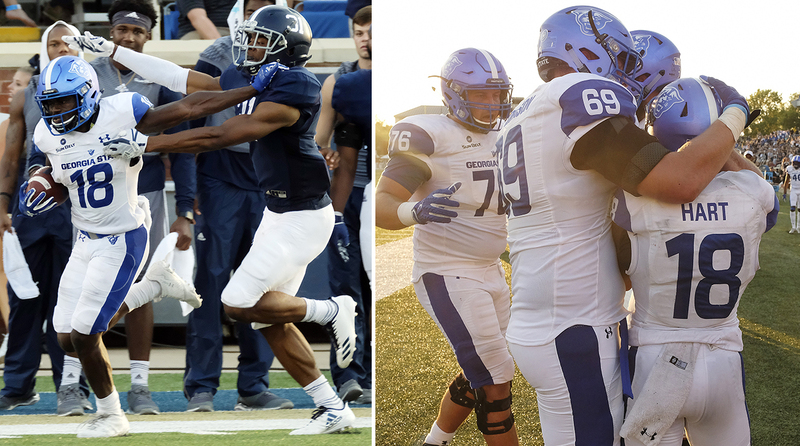 More recently, there was the non-invite to the scouting combine in February despite a couple of 1,000-yard receiving seasons at Georgia State and an impressive week at the Senior Bowl. But much higher up on the cruel universe scale, was that week at the Senior Bowl in Mobile, when Hart, the smallest prospect at the game, found out his roommate would be Donald Parham, the Stetson tight end who, at 6' 8", was the tallest player at the all-star event. “We’re walking out of the elevator together and everyone is looking at us, side-eyed and grinning,” Hart said. Hart had more than 200 catches and 20 TDs in his Georgia State career. This time of year, and this time in his life, is especially grating as he prepares for the NFL draft. In scouting parlance, Hart is considered an “exception” player; a guy who falls outside of the height and weight standards teams usually align their grading scale with. For some coaches and general managers, being outside that scale slices them off the board entirely. For others, it places him into a separate bin of players they’ll sample, but don’t want too many of. But at all levels of football, smart coaches are finding ways to get their best athletes the ball faster and with more room to run than ever before. As one college defensive coordinator put it: The game once played at the width of an office desk is now expanding to swallow the entire football field. And as the field has opened up, gradually, so have opportunities for players like Hart. Last year, our Jenny Vrentas reported that at least one major scouting service began averaging the heights of successful quarterbacks into their data range, making players like Russell Wilson and Baker Mayfield no longer outliers. In subsequent months, there has been legitimate discussion surrounding a team selecting 5' 10" Kyler Murray with the No. 1 overall pick. Their revolution, it seems, is fully on. As for running backs and receivers, the pace of change is more incremental. A deep dive into draft data for all 32 general managers shows some teams clinging steadfast to their ideal ranges for height, arm length, weight and hand size. But make no mistake: Even at the pace the league is headed now, those numbers will look drastically different five years from now. A sampling of general managers at this year’s scouting combine reveal a few different thoughts on size regiments for NFL prospects. • They allow themselves exceptions, but only after a certain round. • They have one and remain mostly attached to that scale, grading exception players in a way that would make it difficult for them to surface as “draftable” on their board. • They have a vague idea of an ideal size, but, like Dimitroff, allow that to change based on league-wide trends. In 2018, the Texans drafted the first receiver of the Brian Gaine era (including the time he was the team’s director of player personnel) who was under six feet, 185 pounds and had shorter than 30-inch arms (WR Keke Coutee). Gaine considers himself a traditionalist, but with a caveat. While admitting that he’s trying to make guys “as prototypical as can be,” his theory is an interesting take on the old scouting axiom, which basically says, If you take too many exception players, you just end up with a roster full of exceptions. Instead, Gaine said, you’re drawn to what helps the team win. If you find yourself arriving at a similar place time and time again that is outside your established norm, maybe that’s the kind of player you’ve actually been looking for all along. Chiefs general manager Brett Veach said he “kind of has a thing” for “220-pound backs that can run and catch and block,” which has held mostly true since he joined the organization in 2013. Excluding De’Anthony Thomas (2014), who was converted to receiver, the two running backs the Chiefs have drafted, Kareem Hunt and Knile Davis, were 5' 10" 216 pounds and 5' 10", 227, respectively. That precision seems to have extended to the wide receiver position, where all but one of the receivers drafted during the Veach/John Dorsey era were between six feet and 6' 3", with arm lengths between 32 and 333⁄4inches and hand sizes between 9.1 and 10.2 inches. “My philosophy is that in your primary rounds, you have to just maintain consistency,” Veach said. “When you get later in the draft, sometimes you just let the tape speak for itself and if a guy can play, he can play. Not to say you won't break those trends earlier on, but I think just in general you just want to maintain the kind of standards you have set, certain height, weight speed, all those kind of things early on. The common thread was that late hedge. Yes we have ideal sizes, but… You want them to look a certain way, except when... If there was a perfect way to capture the state of change, it was there. It is safe to say these conversations are taking place more frequently in draft rooms and in scouting circles. 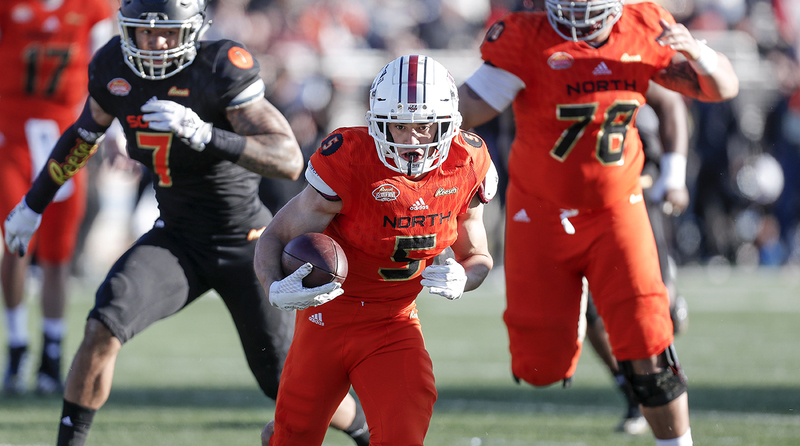 There was relief for Andy Isabella, the 5' 9", 188-pound receiver out of UMass, when he made it an entire week with the Raiders coaching staff during the Senior Bowl without being asked about life at one end of the size curve. While a sampling of scouts did ask him practical height questions during the week—most notably, “How are you going to handle bigger, stronger defensive backs in the NFL?” Isabella was prepared with a stock answer he had solidified over time. Isabella at the Senior Bowl. He was fortunate in that, like Welker, he was paired with a head coach in college that many in the industry had long revered as a mad scientist type. For Mark Whipple, Isabella’s head coach at UMass and now the offensive coordinator at the University of Pittsburgh, Isabella’s size just became another variable in the coach’s obsession to get the ball to his fastest player in space—a concept that seems simple to us now, but took years of solidified proof before many would dabble with the idea. That included 15 new plays per week (Whipple almost always utilized rolling playbooks that changed with each opponent) with a few standards that accentuated his textbook quickness on double-move routes. Hearing Isabella and Hart walk you through the intricacies of their route running process, it’s clear that the inherent advantage in drafting a smaller wideout is that, so often, they felt the need to be better at everything else, because the assumption is that they cannot win routes in a typical fashion (even if they can). Hart’s dad always told him that his only responsibility in football was to create a game with no weakness (no pressure). And still, the recognition comes masked in sarcasm. Like Isabella said, “almost everyone I talk to” says that, at the least, he can catch on with the Patriots as a short, fast, white guy. Until players of their distinction have their Kyler Murray moment, they’ll be here, training, snapping off their routes and shaving milliseconds off their 40 time for a chance into the NFL’s backdoor, politely answering questions about things they can’t control.